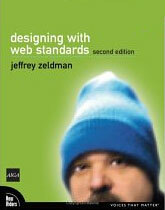 Jeffrey’s Zeldman’s first edition of Designing With Web Standards is as close to blockbuster material as you’ll find in the web design world. With the second edition, Zeldman sweeps the content clean with fresh text, updated screenshots and a fancy green cover. Is it for the standards veteran? No. Is it for anyone else currently breathing? Yes. I could easily start this review espousing the influence Designing With Web Standards has had on the web design community, but it wouldn’t be any espousing you haven’t heard before. Everyone knows the name Zeldman, as well they should. The “orange bible” rests on countless shelves, dog-eared, bookmarked, scrawled in and blanketed in a layer of sticky notes. Too many sites are still inaccessible, and too many clients and bosses (not to mention too many designers), if they know about standards and accessibility at all, still have it dead wrong. It is for them, even more than for you, that I wrote this book. Having read the first edition cover-to-cover, and just finished the second edition, I can confidently agree that the snazzy new green version of DWWS is not written for those who have taken to heart the foundation laid down three years ago. While it is clear Zeldman made a fine-tooth sweep of the book — updating browser versions, discussing Ajax, bringing all the topics up to date (for instance, the recent lawsuit Target faced for its inaccessible website) — a fresh dash of salt and pepper does not a new soup make. In fact, some would argue that not enough updates were made. The most irritating chapter remains: “XHTML by Example: A Hybrid Layout.” Advocating tables for structure contradicts almost everything else in the book, even when the author tries to placate the readership with a discussion on “transitional development.” But again, this book was not written for me. Zeldman is just accommodating his true audience. Designing With Web Standards remains for the web designer, CTO, programmer and client who have not yet seen the light. It covers everything someone new to the standards game needs to know — the basics of CSS, DocTypes, an introduction to the DOM, a bit on character encoding and a lot on the grand why of standards. It is brilliantly written, and someone with even a passing interest in the topic will find himself engrossed in Zeldman’s witty, practical prose. For stylesheet ninjas and tenth-level accessibility warriors, consider saving your dollar for more niche web books worthy of your veteran status. There are plenty. That being said, this book remains a classic. For the web standards newb, or the client wishing to learn the ways of his contractor, Designing With Web Standards could not be more ideal. It will teach you everything you’re looking for and a whole lot more, and will empower you to embrace web standards with confidence. Even with the web moving toward further standard compliance every day, the battle is far from won. DWWS was a battle-cry three years ago, and it rings just as true today. this sounds like a shameles plug? is it? All designers have shame, so it’s just a plug. Well it’s certainly not a shameless plug. Not even sure what either of you mean. Care to clarify? Thanks for this concise review. I have read the first few chapters, and will be purchasing this book in the near future. I would consider myself ‘veteran’ status, but I work with many people who are struggling to put the pieces together. I figure this piece would still be nice for my library. The standard movement only was good in terms of networking. I dont like any of these web standard salon heroes. They are too much hooked on the culture social side of the Net.